The Chinese economy maintained a growth rate of 6.7 percent in the third quarter, keeping the country on track to meet the government's target of 6.5- to 7-percent growth for the year. The figure is the same as the rates registered in the first and second quarters this year. Despite these figures denoting a relatively high level of GDP increase, the numbers contrast with the fact that the economy expanded 6.9 percent in 2015, the country's slowest pace in a quarter of a century. "The overall economic performance was better than expected, and the economy grew steadily with progress being made and quality improved," said Sheng Laiyun, a spokesman for the National Bureau of Statistics (NBS). According to Sheng, the steady growth came as a result of expanded domestic demand, supply-side structural reforms and the strength of new growth drivers. However, Sheng noted that the economy is in a critical period of transformation and upgrading, wherein old growth drivers are being replaced by new ones, many uncertainties remain, and the foundations for sustainable growth are not solid. The Chinese economy has almost reached its nadir, according to Zhang Liqun, a research fellow with the Development Research Center of the State Council, at a seminar held in Beijing on October 26. Robust infrastructure construction, quickening property investment, a rebound in manufacturing investment and fast-increasing domestic consumption will help stabilize growth, Zhang said. "In addition, China's potential in terms of economic restructuring has yet to be fully released. In the long run, the ongoing urbanization drive will underpin long-term growth," Zhang told Beijing Review. As more reform measures are rolled out throughout China and solid economic figures are posted, some analysts' "hard landing" rhetoric is losing touch with reality. For example, in a report released in late September, the Asian Development Bank shared a positive prognosis on China's growth rates in 2016 and 2017. Furthermore, in the World Economic Outlook report released in early October, the International Monetary Fund lowered growth rate forecasts for many developed economies while maintaining expectations for the Chinese economy's growth at 6.6 percent for 2016 and 6.2 percent for 2017. According to Xu Hongcai, Deputy Chief Economist with the China Center for International Economic Exchanges, third-quarter macroeconomic data is quite inspiring, with many positive signs in major economic indicators. Xu said that signs pointing to a stable economy include the quickening growth in industrial value-added output and infrastructure investment, the producer price index (PPI) showing positive year-on-year growth, and private investment rates avoiding slowdown further. Although GDP growth rates were the same in all three quarters, the latest figure represents a larger amount than those of previous quarters, as the economic aggregate is continuously increasing, Xu added. Experts say one of the biggest highlights of the third-quarter figures is the PPI, which measures inflation at the wholesale level. In September, the PPI increased 0.1 percent year on year, putting an end to 54-month-long year-on-year decreases. This means that industrial producers have escaped the conundrum posed by deflation, Xu said. Sheng attributed the improvement to China's efforts to cut excess capacity and promote supply-side structural reforms, especially in the steel and coal sectors. Another positive sign is that the industrial structure is improving, with the growth of strategic emerging, hi-tech and equipment manufacturing industries greatly outpacing overall industrial expansion. In the first three quarters, the value-added output of industrial enterprises increased 6 percent year on year. On the other hand, the value-added output of strategic emerging industries increased 10.8 percent year on year. In the first nine months, the value-added output of hi-tech and equipment manufacturing industries grew 10.6 and 9.1 percent respectively compared to the same period last year. "Hi-tech and equipment manufacturing industries have become new sources of growth, which help improve the quality and efficiency of economic growth and continuously optimize the economic structure," Hu Chi, a research fellow with the Research Center under the State-Owned Assets Supervision and Administration Commission of the State Council, told China Business News. "In the meantime, as China pushes forward supply-side structural reforms, progress has been made in reducing costs for companies as well as in deleveraging efforts. The drop of debt ratios and costs in businesses has lifted industrial profits," Hu said. In the first eight months of the year, industrial profits increased 8.4 percent year on year, a rate 2.2 percentage points higher than that of the January-June period. According to Hu, the PPI's positive growth rate was partly because of progress made in property destocking and capacity cuts and partly because of the demand created by the launch of some large-scale construction projects. In combination with structural improvement in the industrial sector, the service sector also accounts for an increasing proportion in the greater economy. This sector has become a pillar of the national economy and a major job provider. In the first three quarters, the service sector expanded 7.6 percent year on year, which was more than the rates registered by the agricultural and industrial sectors. Services accounted for 52.8 percent of the GDP, up 1.6 percentage points from the same period last year and 13.3 percentage points higher than the proportion taken by the industrial sector, according to the NBS. As a result of the burgeoning service sector, China posted better-than-expected employment data in the third quarter. In the first nine months of the year, a total of 10.67 million new jobs were created in urban areas, accomplishing the government's whole-year target of 10 million ahead of schedule. Despite the upbeat quarterly figures, Xu said that the Chinese economy is faced with six major challenges. First and foremost, the U.S. Federal Reserve is expected to increase its benchmark interest rate later this year. A major spillover effect is bound to occur if the policy is not well implemented. China should be extremely vigilant of a potential blow to the Chinese yuan and keep a close eye on depreciation pressure on the currency, Xu said. Another challenge comes from the cooling housing market which may further increase downward momentum. Next, although a further slowdown in private investment growth has been prevented, it will be difficult to reverse the trend altogether. The government has released a slew of policies in an attempt to boost private investment, but a lot still needs to be done regarding their implementation, Xu said. The fourth challenge is the frequent occurrence of defaults in the bond market. In addition, the rise of non-performing bank loans is raising alarms over ballooning debt risks. The key is to maintain a balance between economic growth and debt control, Xu told Beijing Review. "Corporate leverage should be reduced, while individual and government leverage ratios could be increased appropriately," Xu said. "In the meantime, direct financing should be encouraged, so that businesses can receive funding via equity financing, industrial investment funds, private equity, initial public offerings and reorganization, instead of only by borrowing money from banks." He also called for an increase in the capabilities of regulatory bodies to contain debt risks. Fifth, from January to September, the per-capita disposable income of urban residents increased by a meager 5.7 percent, lower than the GDP growth rate. This will exert a negative influence on domestic consumption, stated Xu. Finally, Xu said that it will be increasingly difficult to carry out supply-side structural reforms, which feature cutting overcapacity, destocking, deleveraging, reducing corporate costs and improving weak links in the economy. "In a nutshell, we can expect stable economic growth in the future, but a slight slowdown may occur in the fourth quarter, amounting to around 6.6 percent." Nonetheless, Xu claimed that the country's macroeconomic trend won't change. China will continue to implement prudent monetary policies and proactive fiscal policies, while constantly attempting to improve the economic structure. More reform policies are expected to be rolled out at a faster pace, he said. "The whole-year growth rate will stabilize at 6.7 percent. If short-term, pro-growth policies and long-term structural reform policies are well implemented, GDP growth will reach 6.5 percent in 2017," Xu forecast. 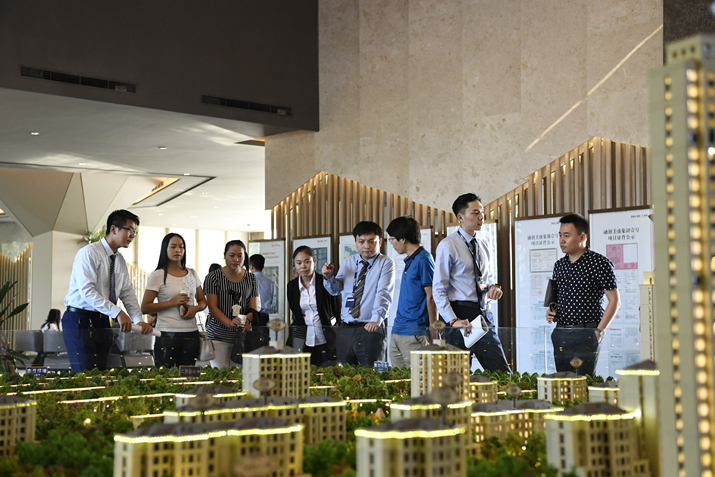 In the first three quarters, new housing loans issued to individuals rose to 3.63 trillion yuan ($535.6 billion), or 35.7 percent of new loans, according to data from the People's Bank of China, the central bank. Economists believe the greatest near-term risk for China is a possible correction in the red-hot property market. The property sector remains an important driver of China's economic growth, contributing around 8 percent of GDP, according to the latest NBS data. Since the beginning of October, 21 large cities across China have released policies restricting housing purchases. These restrictions include higher down payment requirements and re-imposing purchase limits in an attempt to cool down sizzling prices. Measures to cool down the property market would bring short-term downward pressure to affected cities, but their impact on overall economic growth will likely be minimal. "The measures are only targeting speculative behaviors," NBS spokesman Sheng said. According to Zhang, tightening housing market policies won't cause too much damage to GDP growth, as it's only structural adjustment aimed at cooling down overheated development in some regions but not at crushing the entire real estate market. "The purpose is to prevent runaway housing prices from surging in some cities. Differentiated regulations will be adopted in different cities in accordance with local conditions," Zhang told Beijing Review. Housing market regulation is timely and quite effective, he said, adding that housing prices have shown signs of stabilization, but sales volumes haven't been affected. "With developers having less housing inventory and more funds at hand, housing construction will accelerate, lifting the broader economy," Zhang forecast. Although the world has been mired in sluggish economic growth, countries along the routes of the China-proposed Silk Road Economic Belt and 21st-Century Maritime Silk Road are bucking the trend. The Belt and Road Initiative, proposed by Chinese President Xi Jinping in 2013, brings together countries in Asia, Europe and Africa via overland and maritime networks. According to the NBS, despite a slight decline in overall trade volume, China's imports and exports with the Belt and Road countries increased over the first three quarters of 2016. "To realize long-term sustainable development and remove development obstacles, China should steadily push forward the Belt and Road Initiative and the internationalization of the renminbi," said Zong Liang, chief analyst with Bank of China, at a forum held by Renmin University of China on October 24. 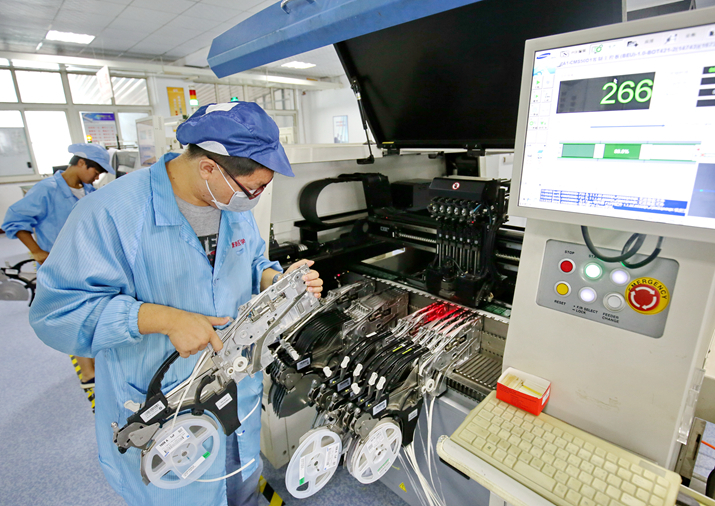 -Value-added output of industrial enterprises above a designated size—those with principal business revenue of more than 20 million yuan ($2.95 million) a year—grew 6 percent. Value-added output of strategic emerging industries increased 10.8 percent. -Energy consumption per unit of GDP decreased 5.2 percent. Consumption of clean energy, including hydropower, wind power, nuclear power and natural gas, accounted for 19.3 percent of total energy consumption, up 1.7 percentage points from the same period last year. -Retail sales of consumer goods totaled 23.85 trillion yuan ($3.52 trillion), up 9.8 percent. * Online retail sales amounted to 3.47 trillion yuan ($512 billion), up 26.1 percent. -Foreign trade in yuan-denominated terms decreased 1.9 percent to 17.53 trillion yuan ($2.59 trillion). Exports decreased 1.6 percent to 10.06 trillion yuan ($1.48 trillion), while imports dropped 2.3 percent to 7.47 trillion yuan ($1.1 trillion). -A total of 21,292 foreign-funded companies were set up, up 12.2 percent. -Non-financial foreign direct investment in the Chinese mainland stood at 609.03 billion yuan ($89.86 billion), up 4.2 percent. -Chinese investors made non-financial outward direct investment in 6,535 overseas companies in 160 countries and regions, totaling 882.78 billion yuan ($130 billion), up 53.7 percent. -The consumer price index, a main gauge of inflation, rose 2 percent. The producer price index, which measures inflation at the wholesale level, contracted 2.9 percent. -The service sector accounted for 52.8 percent of GDP, up 1.6 percentage points than the same period last year and 13.3 percentage points higher than the proportion taken up by the industrial sector. -New yuan-denominated loans amounted to 10.16 trillion yuan ($1.5 trillion), 255.8 billion yuan ($37.74 billion) more than the same period last year. -At the end of September, M2, a broad measure of money supply that covers cash in circulation and all deposits, had reached 151.64 trillion yuan ($22.38 trillion), up 11.5 percent, and M1, a narrower measure of money supply, rose 24.7 percent year on year to 45.43 trillion yuan ($6.7 trillion). -Total social financing, a measure of the funds raised by entities in the real economy and a broad measure of liquidity in the economy in general, totaled 13.47 trillion yuan ($1.99 trillion), 1.46 trillion yuan ($215 billion) more than the same period last year. Note: All growth rates are on a year-on-year basis. * The growth rate has been adjusted for inflation.